Just recently found another few Merckx sponsored teams. First up is Marc-V.R.D., starting in 1980! Might have been the first Merckx sponsored team. Their frames looked somewhat similiar to the above. Marc teams continued to use Merckx frames for a couple of years, but I haven't found any decent pictures to indicate what they looked like. 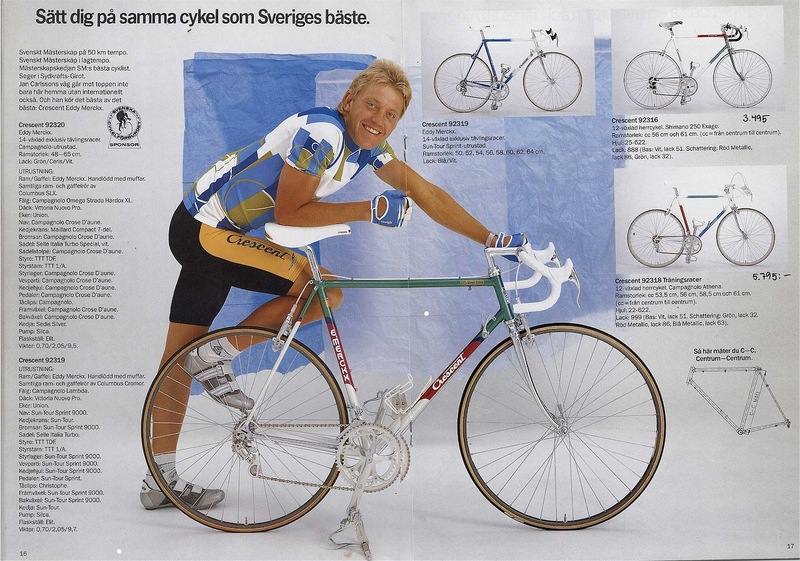 In 1985, Tönnisteiner roade Merckx frames. Here's a black and white picture of Filip Cottenies. In this picture, you can just make out someone (might be Cottenies, I'm not sure) on a white frame with a red head tube and read seat tube panel. So as I noted in my last post, there are probably a ton of Merckx team frames I know nothing about. There are some main stream(ish) teams I haven't been able to track down, and dozens and dozens of continental teams I've never heard of, let alone seen a picture of. 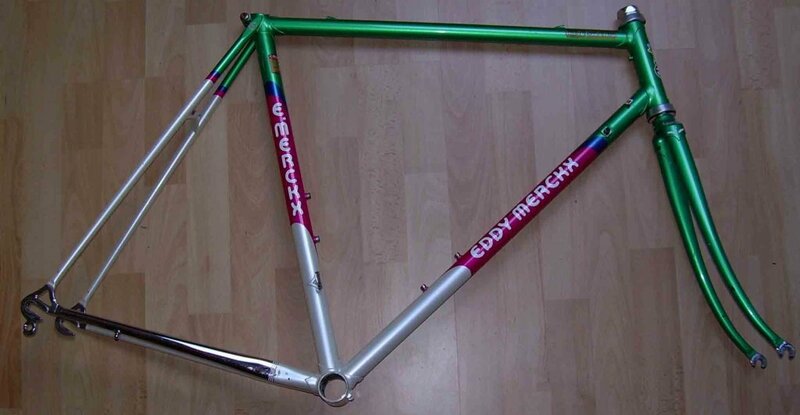 I'm looking for more teams riding Eddy Merckx bikes from 1980 through about 1998. 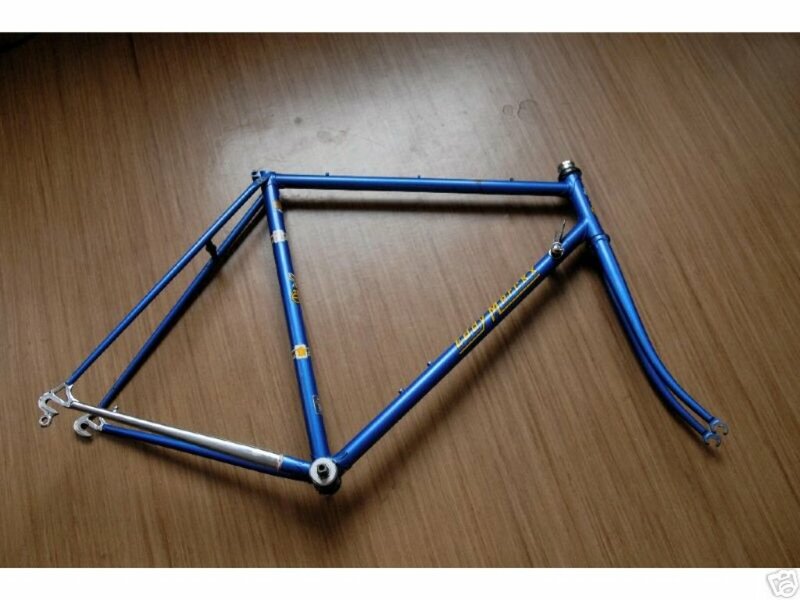 This primarily means steel frames, built in the Merckx factory in Belgium. To positively identify a Merckx team color scheme, you need only send me a clear picture of a team rider on the frame that shows the primary details of the color scheme. A team color scheme means that the whole team rode/rides that scheme. If there's a color scheme i've missed for a team I've already identified, that counts -- I bet there's at least 1 other Kelme. I'll set a deadline of November 1, 2007. You can send me info at merckxteams AT tearsforgears DOT com. The two frames above are a decent place to start -- that I can't ID them is driving me crazy. The top is from 1986/87, and the bottom from 1988/89. Good luck, and send me what you have! If you're the only person to respond, you just may win! Still no new teams sent in! All it takes at this point to walk away with the super cool jersey above is identifying one new team. That's it! I'll mail the jersey anywhere in the world, postage paid for by me! The United States' first team to make it in the pro peloton ranks, 7-Eleven! 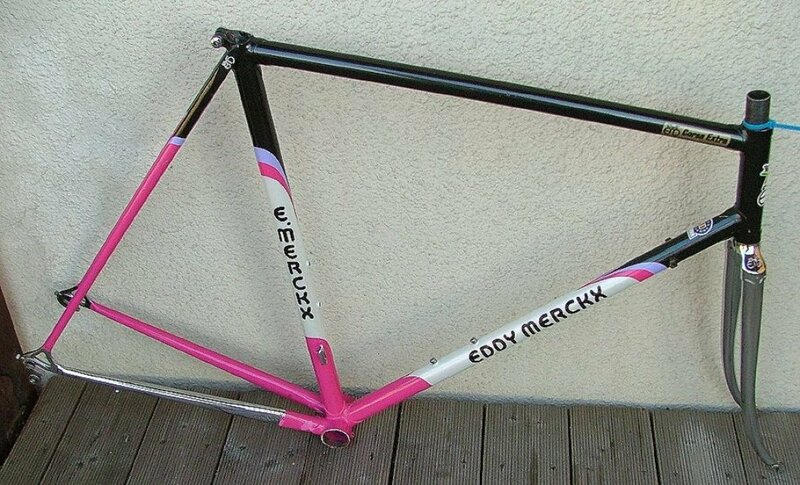 After years of having their downtubes sullied with Huffy and Murray decals, they switched in 1989 to Eddy Merckx frames for their final two seasons. Motorola. The above is Michael Dernies' team issue Motorola Merckx, in Columbus TSX. Motorola is best known by many as the team Lance Armstrong rode for when he won the worlds in 1993. Here's a picture of Michael Dernies on his Motorola Merckx. Maybe its the same one (or maybe not). 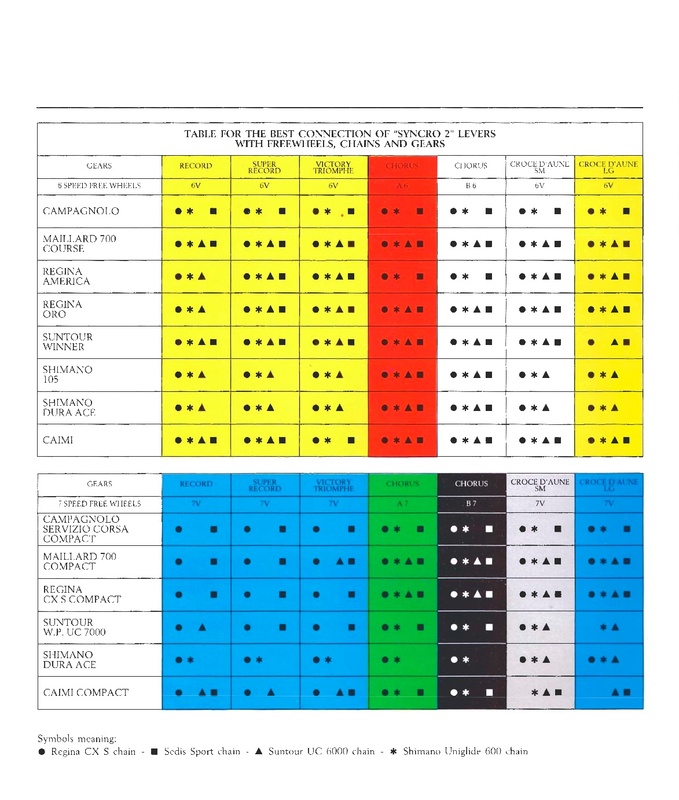 In 1996, Gan rode blue MX Leaders and Arcabaleno's, as you can see in this picture. In 1997, they switched to white frames, that look like steel -- . If they were riding steel in 1998, I'd be pretty surprised. Vlaanderen 2002 rode yellow MX Leaders, as seen here, here, and here. Finally, it looks like S.E.F.B. Spaarbank rode the same colors as Domex/Weinmann in 1989. So thats all of the Merckx team frames I've found. There are a few I know I'm missing, including IPSO/Euroclean, Hueso, Westwood...I know someone out there knows a couple of those. With my next post, hopefully I'll motivate some of you to lend me a hand. First up, we have the La William team from 1989. They rode a yellow and blue frame, with a lighter blue point. I've never seen one. I have no idea if the scheme was ever available to the public. Anyone have one? Domex/Weinmann, and later just Weinmann, were responsible for 2 separate team liveries. 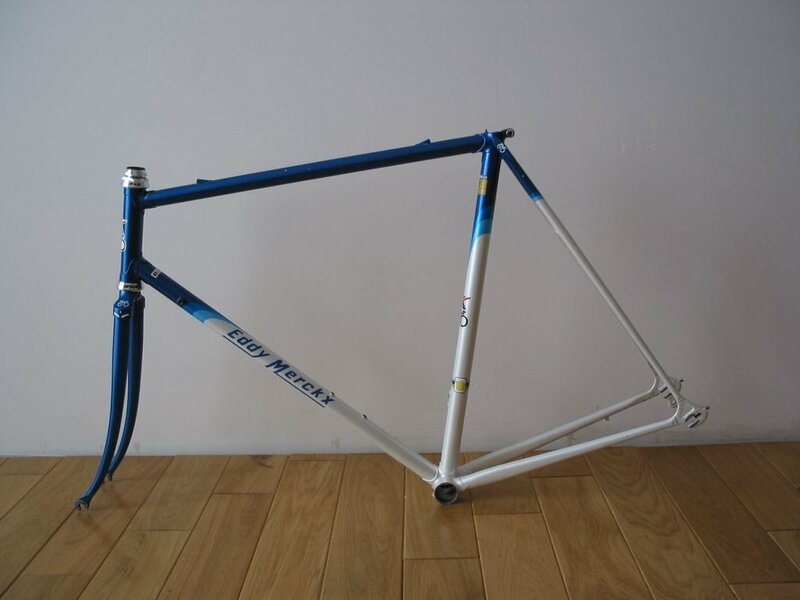 The Domex/Weinmann team frame was a pretty attractive one, in white and blue, with orange accents. While the team photo, in black and white, is entirely useless, a picture here shows it off nicely. Strangely, however, my serial number database doesn't have any examples. I'm almost positive, however, that I've seen them. Do you have one? How is it you haven't sent me pictures and your serial yet?! In 1990 and 1991, Domex and Weinmann split up. The Weinmann team continued on Merckxs, in a new color scheme, as seen above. To go with the worlds ugliest jersey, they settled on a color scheme that, strangely, works. Course, I'm the guy with the purple and orange blog color scheme, so take that opinion with a grain of salt. For those of you who don't believe anyone would match hot pink with neon yellow and purple, here's just one sample of a team member in a publicity shot. They all look equally confused at how a color blind person managed to design their color scheme. I finally found evidence of what I've suspected -- that the Weinmann color scheme in 1990 is a little different. You can see it above from a Crescent catalog. It lacks the pink rear triangle and bottom bracket areas, and reverses the green and pink in the points -- as seen here. You may be noticing, I'm a big fan of de weilersite, aka cyclingwebsite.net for those of you who, like me, don't speak dutch, as well as hour.be. I don't speak flemish either, but the list of teams can be found here, and riders here. Next up, we'll shift to some of the pretty well known teams: Lotto, Kelme and Panasonic. In the mid-80's through mid-90's, Merckx sponsored a number of professional cycling teams. Each had a specific color layout for their frames. Some of them are very familiar -- the purple and pink of Telekom, the red and green of 7-11, while some of them are a little less familiar. Here's a list of the ones I've documented. 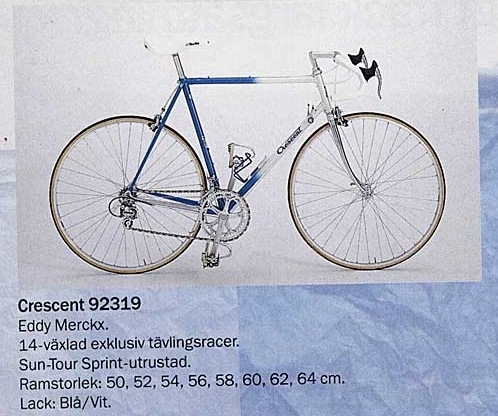 Where there are examples in the Merckx serial list, I show a picture. Where I don't have a sample frame picture, I'll link to a picture of a team member astride one. I'll post a few color schemes each day. I'm lazy like that. Its worth noting that some of the team livery frames were ridden by multiple teams, seperated by a few years...in at least one case, 7 years. ADR, from 1988. You can see a picture of Eddy Planckaert astride one here. A reader was kind enough to drop me an email, letting me know that in Sweden, this color scheme was associated with the PK-Banken semi-professional team. We'll see another example of this with a different color scheme, where the second team rode the same frame labeled as a Caloi. Any guesses on the teams? Team Hitachi, 1988/89. 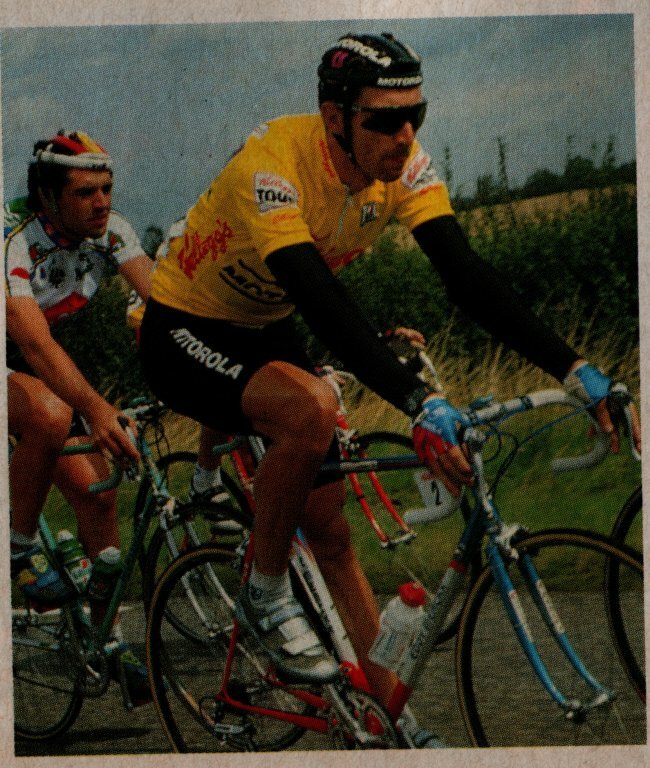 Claude Criquielion riding his, in the 1988 TdF. 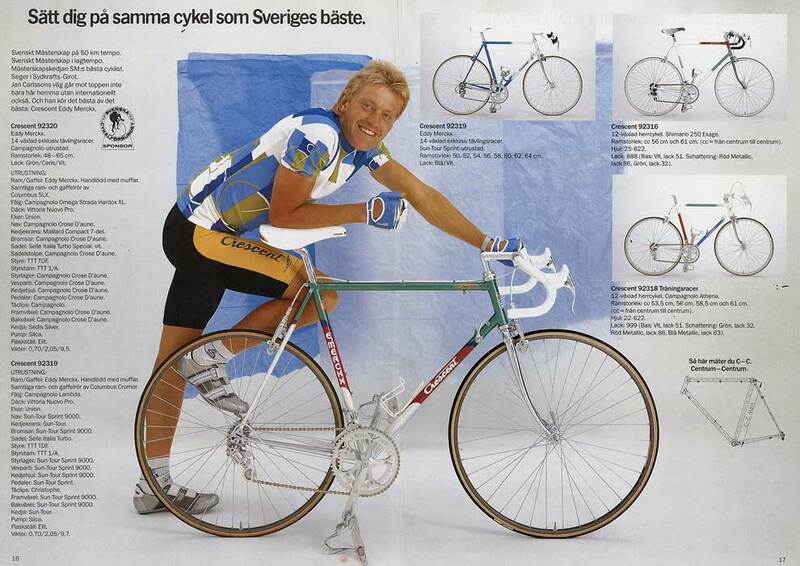 Next post, I'll cover the Domex/Weinmann team frames (there are a few), and La William. Exciting, no? 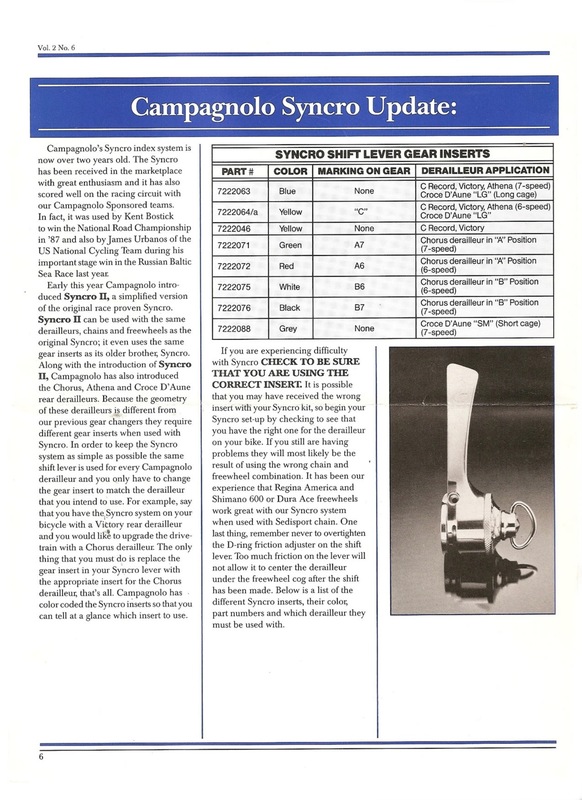 I've had a few people email me looking for some insight on setting up Syncro shifters. I don't claim to be all knowing on the subject, but I have had some success based on info I've read, as well as a couple of tricks I've picked up. First things first. 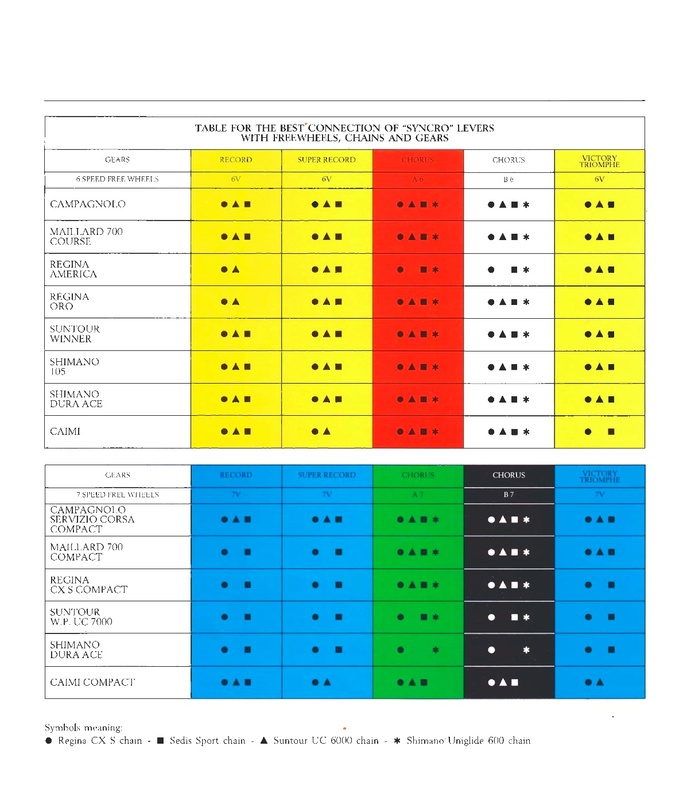 The first thing you MUST do is consult the tables provided by Campagnolo with regards to what combinations of freewheel, chain, dérailleur and shift collar work together. Yes -- the different colors of collars can be hard to find. In some ways, I'd suggest selecting your derailleur, freewheel and chain based on the collars you have access to. Some substitutions will work better than others, but unless you have lots of time and lots of spares, stick with something that Campy published as working. It can be hard enough setting up Syncro with the correct equipment. One tip I read that seems to help comes courtesy of a usenet post by Andrew Muzi over at Yellow Jersey. He advocates artificially wearing the teeth of the shifter notched insert, using a buffing wheel. I used a dremel with a little bit of buffing compound, which also works. The goal is to take some of the square edges off the teeth of the collar. This eliminates some of the harsh edges you'll encounter when shifting, and make the whole system a little more tolerant of imperfect shifts. The above shows a slightly worn blue insert. Might be hard to see in the picture, but the tops of the notches begin to round slightly when they wear. The goal is to simulate repeated shifting, and eliminate any break in time for the shifter. 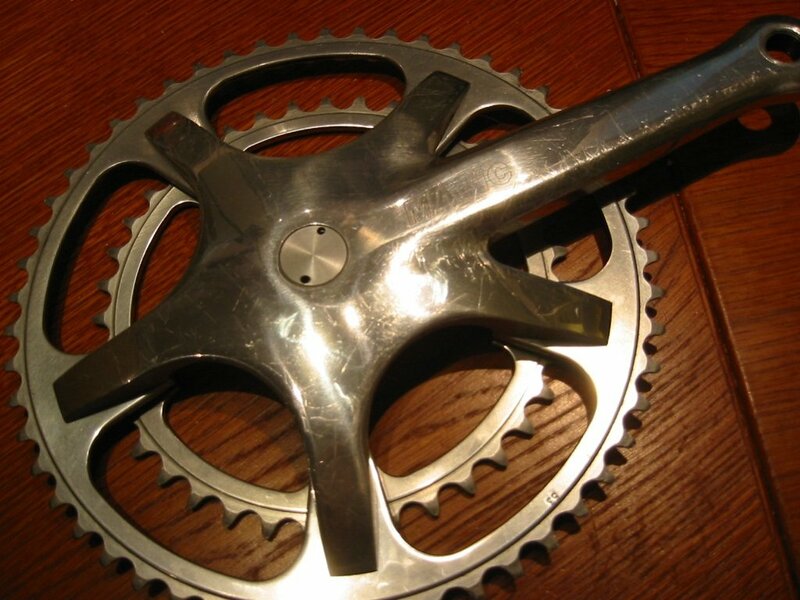 There are also some who advocate using a floating upper pulley -- similar to the kind you'd find in a modern derailleur. The bearing units tend to be more precise, and indexing systems can benefit from a little wobble as they're shifting. It provides a little overshift, to get the chain up on the next cog, and then lets it sort of float back to the appropriate location. Personally, I haven't had to resort to this, but it may make the system a little less finicky. If your derailleur doesn't have a barrel adjuster, it should. Some Syncro shifter sets came with one, and once Syncro continued, derailleurs came with them. You need this for the fine-trim on your derailleur. The Campy supplied one is shown above, but you can cobble one together from your parts box. One thing I've never read anywhere, but really seems to have a positive effect, is tightening the indexing lever more than you'd think. If you're used to modern indexing systems, you know the tension on the lever really has no impact on the quality of shifting. The tension isn't really all that adjustable. On the Syncro, however, having it snugged down further than you think seems to improve shifting accuracy immeasurably. If you hear a discreet 'click' when you shift, make them tighter! Mine make more of a thump sound when shifting...If you're used to friction levers, you will not end up tightening the indexing lever enough. Don't strip anything, but don't be shy either. I think this is related to the 2 springs not providing support for the insert when not tightened down (hence the eventual move to a much much better 3 spring version post-95). Just be careful -- I've seen cracked inserts before. Use modern derailleur cables. They don't have as much stretch in them, and that seems to be a good thing. The use of linear cable housing may also be a wise thing, although I have to admit -- I'm using spiral housing successfully. My setup works beautifully, if I do say so myself. I do *not* have to overshift, which was a common complaint with these. I think the wearing of the collar, in conjuction with the tight indexing lever makes all the difference. Curious about my setup? I use a Croce d'Aune derailleur, Regina Oro freewheel, CX chain and the yellow collar with Syncro 2 levers. Here's a gratuitous picture -- a pile of NOS Syncro II's. Its all part of my effort to corner the market in obsolete, inferior technology.